If you’ve heard about mobile money & East Africa, you’ve probably also heard about M-PESA. M-PESA is basically a way to transfer money over ubiquitous mobile communication networks. Mobile phones have proliferated Kenya & East Africa and as per the Communication Authority (regulator) in Kenya, there were total number of 30.5 million mobile subscriptions as of 2013. Technically, M-PESA and other mobile money services are a form of digital currency. It is a centralized issuance system of electronic money pegged to the national currency, KES (Kenya Shilling) on a 1:1 ratio. It’s run by Safaricom Ltd., a mobile telecoms subsidiary of Vodafone UK. Through its broadly distributed agency network, users are able to exchange fiat cash for equivalent issued money on their mobile wallets. They can then send this emoney to a user of their choice identified by a unique cellphone number. The fee schedule varies depending on the amount and the type of transaction (sending/withdrawals). No fee is charged for getting money onto the M-PESA system. A % fee is deducted for sending and converting electronic money into cash on the receivers end. M-PESA is a centralized trust based system with agents serving as exchanges at the entry & exit points. This is the M-PESA network. Sources close to Pelle and the Kipochi project believe it was shut down because it posed a competitive threat to Safaricom’s dominant M-PESA money transfer business. Kipochi wallet relied on integration with M-PESA network, using M-PESA’s agent network as an exchange to get money onto its wallet. The Bitcoin network is hailed globally for its ultra-low transaction cost (0.1%) and its unlimited geographical scope. What Kipochi did was to leverage these attributes and allowed its users to send and receive money to/from other users locally & internationally. 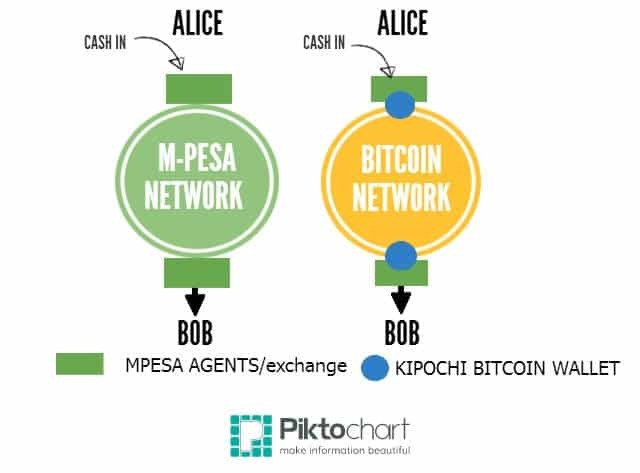 Through a web enabled phone, users could easily convert their KES in their M-PESA mobile wallets into bitcoins and transfer this value over the Bitcoin network to a user of their choice by their unique cellphone identifier number. Essentially, this bypassed M-PESA fees associated with transferring money from one user account to another. Once funds were received, they were credited into the receiver’s M-PESA account as KES. Kipochi did not charge anything for the transfer and made Bitcoin easy to use. The only cost associated with the transfer was the inherent bitcoin transaction fees – a flat 25Ksh fee. What’s more, with Kipochi, money could be transferred to and from anywhere around the world i.e. local and cross border remittances. “One third of Kenyans now have a Bitcoin Wallet” – was a distorted title on an article about Kipochi. There’s plenty more of such misinformation plastered around the internet. This misstatement of facts is a myth that’s been wrongly quoted in a lot of articles online. As a Bitcoin advocate myself, I certainly get the excitement around Bitcoin and value transfer. However, it’s important that the truth is not misrepresented. This misrepresentation likely stemmed from the integration of Kipochi with M-PESA which has a large unrivalled user base rate in Kenya. M-PESA subscribers stand at 10,232,805 active mobile users which translates to about 23% of current population estimates. Bitcoin is still largely unknown in East Africa and Kenya. There are those who’ve heard of it on mainstream media and have a distorted view of what Bitcoin is. Young budding developers in Nairobi’s praised Silicon Savannah know little of it and have yet to explore its potential. There are plenty of use cases for Bitcoin in Kenya, East Africa & greater Africa. Bitcoins (the currency) are a small part of the potential of Bitcoin; the Bitcoin protocol and network is the mother lode! Therein lies immense potential to tackle some of Africa’s antiquated and emerging problems. Just to mention a few – digital financial inclusion, governance, ecommerce, remittance, international trade, financial markets & empowering the youth of East Africa access to a global market for their products and services. For this to happen, the public needs to be informed and made aware of Bitcoin and its strengths. Developers across East Africa’s widely-touted tech hubs can begin experimenting with the network and build applications around it. Merchants, entrepreneurs and businesses will need to embrace Bitcoin. All these activities will grow the Bitcoin ecosystem in East Africa. There are massive efficiency gains to be derived from adoption of digital currency technology. The African Digital Currency Association is dedicated to seeing this through. There are regular Bitcoin meet ups happening in Nairobi over the past 6 months and the community is growing. Get in touch with the ADCA at [email protected] to find out more about our activities. You can also visit our website to find out more.